New Jaguar XJ: tech and prices | What Car? Jaguar's all-new XJ is the company's most high-tech car ever. If the bold looks haven't convinced you of that, the list of gizmos and features will. 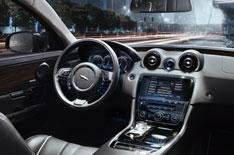 One of the main innovations is the XJ's 'virtual' instrument display. There are no conventional dials at all; instead there's a 12-inch, high-definition screen that can display a range of different information. Press the starter button turning a key is old hat and, as with the XF, a circular gear selector rises up out of the centre console to greet you. At the same time, a conventional-looking speedo, rev counter and fuel and temperature gauges appear on the screen. If important information needs to be shown, such as if fuel is running low or the driver is selecting a radio station, the rev counter fades away to be temporarily replaced by the relevant message or menu. In dynamic mode, the dials have a sporty red glow and you can also change the settings so that different information, such as a sat-nav display or control menus, are shown. There's also an eight-inch touchscreen display in the middle of the dashboard that controls most of the major functions. That's nothing new, but the XJ's has a dual-view system that allows the driver and front passenger to look at different content the passenger can watch a DVD while the driver views a satellite-navigation display, for example. The XJ also has the latest version of Jaguar's voice-control system, which now uses a list of prompts for key words to control various functions. Jaguar says that the new 'say what you see' approach allows the driver to quickly gain confidence in the system. A sophisticated multimedia system will also come as standard. The range of systems available will include CD and DVD players, DAB and HD radio, digital TV, two USB ports, Bluetooth and a hard drive that stores music files. The top-of-the-range audio option will be a 1200watt Bowers & Wilkins stereo. Those in the back don't miss out, either the optional rear seat entertainment package includes eight-inch LCD screens in the front headrests, wireless infra-red digital headphones and a portable touchscreen controller. Four versions of the XJ will be available Luxury, Premium Luxury, Portfolio and Supersport. There's also a choice between standard and long-wheelbase versions, with a £3000 premium for the extra rear space. The new XJ is available to order now, with the first customer deliveries due in early 2010.